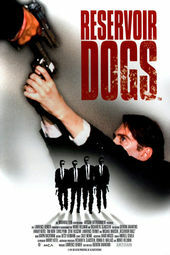 Quentin Tarantino came out swinging with Reservoir Dogs, his salty, foul-mouthed directorial debut. As the besuited band of men strolls down an alley, each actor is introduced in a mustard serif typeface and the George Baker Selection’s 1970 hit “Little Green Bag” pulses upbeat. The sequence, originally filmed in 24fps and stepped down to an almost-jumpy 12fps, achieves a sort of snappy grace. Slowly, the title sweeps up into the frame and the men get smaller in the distance as K-Billy's Super Sounds of the Seventies Weekend just keeps on truckin'. This opening would be parodied four years later in Doug Liman's Swingers, appearing right after a sequence in which the characters discuss Hollywood directors copying from other directors' films.